During the first week of December, Portland and the surrounding areas were hit with record rainfall. My first morning drive to work, of what was to turn into weeks of downpours, felt like a car wash except for my disobedience to all the rules. My car was not in neutral, my foot was gently on the accelerator and my hands most definitely were gripping the steering wheel. The ground seemed to cry “uncle” and could not keep up with the pace and quantity of rain leading to flooding and landslides. Puddles and standing water were everywhere making it difficult to walk let alone drive without extreme caution. A few days into the deluge, I was driving home from work, the rain had lightened up and the sun decided to peer through the grey sky. As the sunshine began to stretch wider and longer, a single ray landed on an impressive high-rise. I took my eyes off the road in front of me for a moment and gazed at this beaming building in the sky. The sun flickered enough to cease blinding my sight and revealed 5 letters across 5 window panes. I locked eyes on the word, glanced back at the road and cars in front of me and then lifted my chin up. 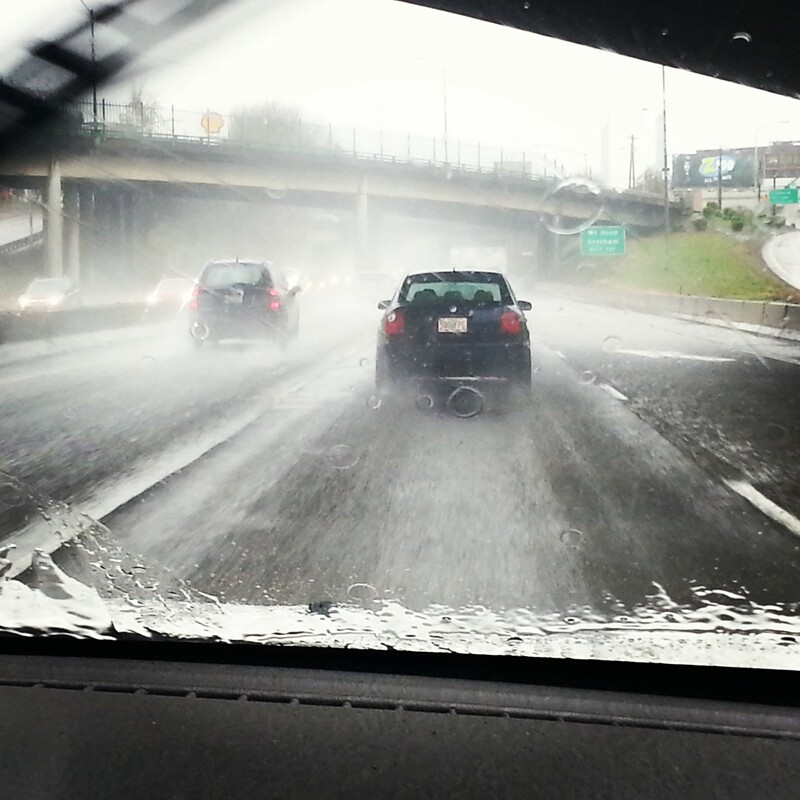 I admit wanting to snap a quick photo but you know, I was driving…on a freeway. I was caught off-guard as tears began to coat my cheeks. I have no idea the window owner’s intention. All I knew was this year my heart had been flooded by images of Paris, black bodies in the streets, weary refugees and thoughts about a man with power, position and a platform shouting out words of fear and hate. Does his loud voice speak for the hushed beliefs of others? In the ensuing weeks, I continued to look up through the clouds to see a word which continued to settle and help me exhale most of what is contained in a day. I am not sure how many years, I have chosen a word or phrase to embrace for the year ahead. I have grown to cherish this practice. Some years, it has been a challenge and other years, like this one, it has beckoned to me from the sky. My word for 2016 is peace and to further solidify the choice, unbeknownst to me, Carl picked the same word. Whenever I choose a word in January, I always believe I know the reasons but there are always surprises and deeper purposes than I know at the time. This is what I know now. There are times when our lives become so saturated with the cares and concerns of our lives and world that the evidence comes by way of flood or landslide. I believe there is a way to live at peace despite the deluge of life. I want peace to reign in the world and I will pray and do my part for that end. But peace has to be at work in my heart, my actions and my emotions. The way I treat others or even mutter about them in the confines of my car speaks to the place of peace in my life. obliterating the blessed fingerprints all over my life. I want peace to be an umbrella over the good and hard throughout my days. The good is present, the hard may arrive but God has not changed. I must allow Him elbow room in my heart and mind. I want His peace to invade my life to such an extent my heart can’t keep up with its pace and quantity. The only solution is to allow the runoff to saturate the world around me. That’s the best kind of flood. And know that the peace of God (a peace that is beyond any and all of our human understanding) will stand watch over your hearts and minds in Jesus, the Anointed One. Finally, brothers and sisters, fill your minds with beauty and truth. Meditate on whatever is honorable, whatever is right, whatever is pure, whatever is lovely, whatever is good, whatever is virtuous and praiseworthy. Keep to the script: whatever you learned and received and heard and saw in me—do it—and the God of peace will walk with you. The Eternal One bless and keep you. to look upon you and give you peace. Helen, it does seem, in the middle of a deluge of nothing but difficult tragedies and the awfulness of men that peace is far from us. But you’re right, we can bring it wherever we are. It blesses me to hear how God confirmed your word for you. And the priestly blessing/prayer from Numbers? I just wrote that down in my journal the other day…and rewrote it last night in another one. We have to keep turning towards God to find our peace. What a great word for 2016. I’m grateful for your lovely and encourageing words you share with us! This is beautiful, Helen. I felt many of the feelings you described. Thank you for the reminder that God never changes. He still good, and there IS still good in this world. We just need to focus on it and work with him on spreading it.